I've always assumed that beauty is in the eye of the beholder, but most of us will agree that an unexpected outcome can throw any of us for a loop. Because of this, I was also interested in your comments on this. One consideration is planned usage. Though it looks like a scarf, I wove it for cutting up into exchange samples. 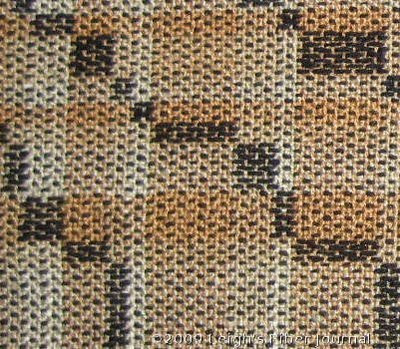 Consequently all the weft ends are hanging out of the selvedges rather than being woven in (I changed weft color with every treadling block.) I need a total of twenty samples for the exchange, but it won't take all of it. While I was weaving away, I thought about using leftovers for a vest. Maybe version B with a black velvet collar? It smoothed out nicely. Bettina did make a good point in the comments however, that it will likely want to bubble up again after washing. I don't figure that samples will be washed, and my vests are more likely to get dry cleaned, so that may not be a problem. Lynette brought up another good point, that of visual competition between the shrinkage texture and the color pattern. For this sample, the focal point is the tabby-like stripes against a tortoiseshell-like background. (See Inspired By Catzee.) The bubbles and dimples from the differential shrinkage should probably be a design feature on its own. So I've come up with a plan. I'm going to press out Catzee's Cloth, and then experiment with differential shrinkage on a scarf. I will still weave it in summer and winter, just in simpler colors. The interesting thing about all this is that I never expected to take this direction in my weaving. But thanks to this happy accident and all your encouraging comments, it's a step I'm going to take nonetheless. the vest would look nice in that fabric! you could always test what happens by wetting a small part of the ironed fabric to see how it behaves? Wow---20 samples! In our group there are usually just 8-10 to weave. I wonder if the bumps were really caused by differential shrinkage since you could press them flat. 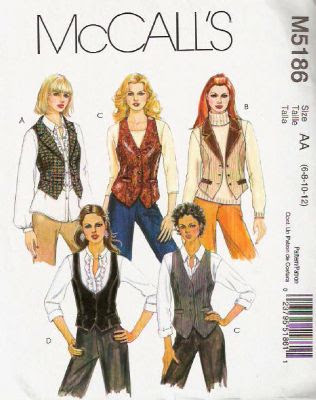 I'm glad you wove enough for a vest. We have 17 in our exchange, plus three extra samples are needed for extra sample books. I would be curious as to the sizes of the various other CW study groups. I also gave you the Proximity award on my blog today even though MiniKat already gave it to you. The qualities of the award made me think of your blog and so I just had to do it too. However, I know this is accidental, I think you need to work with what has happened rather than try to tame it, and it should be good for making a cosy scarf. It's one of those fabrics that I look at and say, "well it's not quite my cup of tea" but there's something about it that's very distinctive and somebody somewhere will look at it and say "wow, love it". I love how it came out after ironing. It would look great as a vest. I can't believe you are doing 20 samples.